Rising disposable income, growing concerns for energy efficiency and expansion of public & private infrastructures and National Infrastructure Plan are the key factors expected to drive Mexico's air conditioner market. According to 6Wresearch, Mexico's Air Conditioner market is projected to grow at a CAGR of 5.69% during 2016-22. Though, Mexican air conditioner market recorded negative CAGR during 2012-15, but is likely to post growth over the next six years. Declining construction sector and falling currency have significantly impacted the growth of the air conditioning market during this time period. The report thoroughly covers the air conditioner market by types, applications, and regions. The report provides an unbiased and detailed analysis of the on-going trends, opportunities/high growth areas, market drivers, which would help the stakeholders to decide and align their market strategies according to the current and future market dynamics. • Historical & Forecast data of North America Air Conditioner Market for the Period 2012-2022F. •	Historical & Forecast data of Mexico Air Conditioner Market Revenue for the Period 2012-2022F. •	Historical & Forecast data of Mexico Window AC Market Revenue & Volume for the Period 2012-2022F. •	Historical & Forecast data of Mexico Split AC Market Revenue & Volume for the Period 2012-2022F. •	Historical & Forecast data of Mexico Packaged AC Market Revenue & Volume for the Period 2012-2022F. •	Historical & Forecast data of Mexico Ceiling Concealed AC Market Revenue & Volume for the Period 2012-2022F. •	Historical & Forecast data of Mexico Cassette AC Market Revenue & Volume for the Period 2012-2022F. •	Historical & Forecast data of Mexico Floor Standing AC Market Revenue & Volume for the Period 2012-2022F. •	Historical & Forecast data of Mexico Suspended AC Market Revenue & Volume for the Period 2012-2022F. •	Historical & Forecast data of Mexico Centralized AC Market Revenue for the Period 2012-2022F. •	Historical & Forecast data of Mexico Centralized AC Market Revenue, By Segments for the Period 2012-2022F. 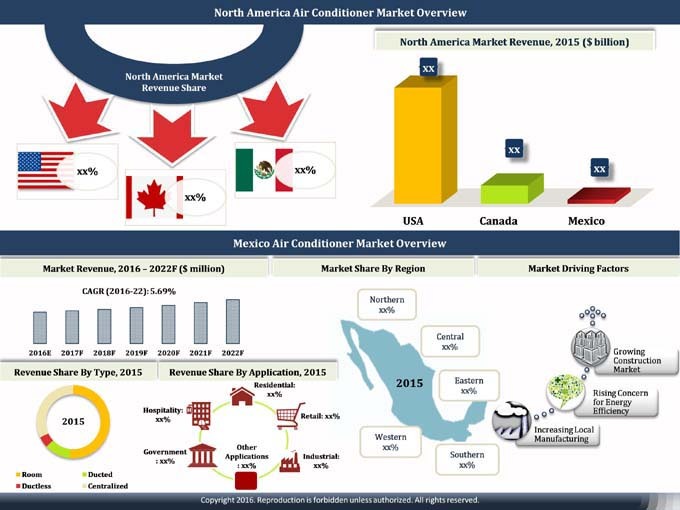 •	Historical & Forecast data of Mexico Air Conditioner Application Market Revenue for the period 2012-2022F. •	Historical & Forecast data of Mexico Air Conditioner Regional Market Revenue for the Period 2010-2015. 15.1	Carrier Mexico S.A. de C.V.
15.2	Trane S.A. de C.V.
15.3	Daikin Air-conditioning Mexico, S. de R.L. de C.V.
15.5	Whirlpool Mexico S.A. de C.V.
15.6	LG Electronics Mexicali S.A. de C.V.
15.7	Controladora Mabe, S.A. de C.V.
15.9	Hitaircon S.A. de C.V.